Hero Arts + A Blog Named Hero Holiday Blog Hop and Giveaway! This is my first post for today! If you’re looking for the Lawnscaping Challenge please click here! Good morning! 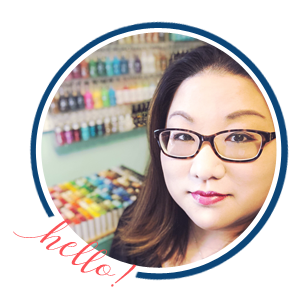 I am super excited to be participating in a holiday blog hop with the awesome ladies from A Blog Named Hero and the fabulous design team from Hero Arts! Make sure you read through the entire post for the grand giveaway details! Here’s my Hero Arts holiday card! I started off by embossing the mistletoe onto red cardstock with gold tinsel embossing powder. 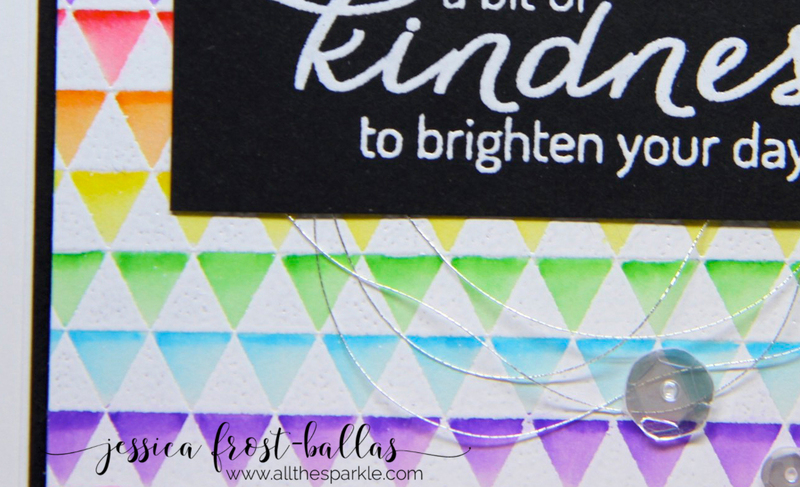 I stamped the beginning of my sentiment onto a white die-cut circle and embossed it with the same powder. Next I die-cut a circle from the center of my red panel and inserted the die-cut circle. 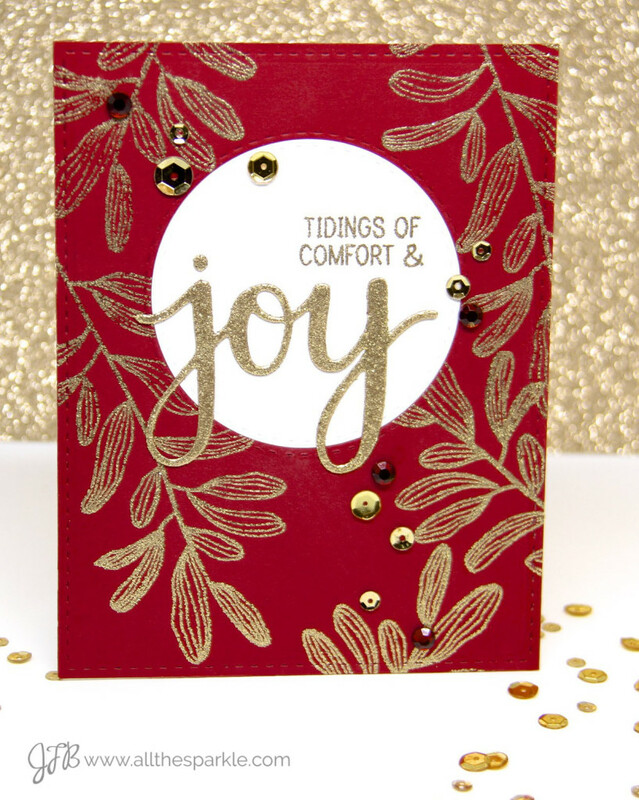 I used the leftover white cardstock to die-cut the word ‘joy’ and heat-embossed it with gold tinsel embossing powder to create a glittery die-cut. I adhered that to my card base and added a few gold sequins and red gemstones to finish my glitzy holiday card! Hero Arts is giving away THREE of the November 2015 My Monthly Hero kits to hop commenters! The winners will be randomly chosen from all of the blog hop comments, across all blogs, received by 11:59 PST on Sunday, November 22nd! Check the Hero Arts blog for the announcement of the winner on Tuesday, November 24th! You should have arrived from Amy and your next stop will be Mateja! If you happen to find a link that doesn’t work, you can hop back to the Hero Arts blog for a list of direct links to all the blogs in today’s hop! Thanks so much for visiting! If you’re a first time visitor I hope you’ll come back again soon! You can follow me on instagram or subscribe to my blog via the button on the right side of my blog! Have a fabulous day and enjoy the rest of the hop! A Blog Named Hero: Rainbow Kindness! oooooohhhh…yum to red + gold. LOVE your GLORIOUS gold embossing against the red and white, it is SO ELEGANT!!! LOVE the fonts of the sentiment too!!! Ooooh this is so elegant and gorgeous, love! Perfect and joyful creation in the combo of red and gold! Totally love it! Beautiful card. I love the bold statement that the combination of the red card stock, die cut, stamping and heat embossing makes. Very effective! I like the elegance of your card. This is such a bright, beautiful card! 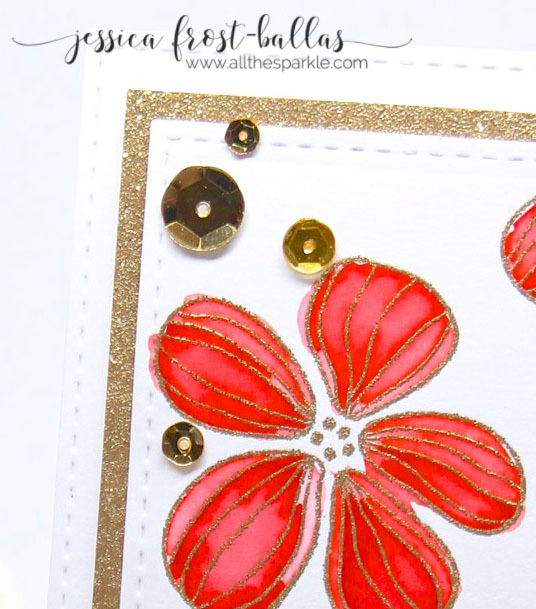 The gold glitter embossing powder is simply stunning, and I love the background you created! Very festive colors n card! Just saw your gorgeous card on Instagram. Love the classic red and gold. Gold & red are so striking & elegant! There you go, doing your brilliant thing again. What a lovely gold and red treasure this is. Just beautiful. Such an elegant card. Love the traditional combo of colors. Sooooo pretty Jessica! The sparkly gold with rich red color is so yummy together. Beautifully done background paired with that awesome die cut sentiment.